Welcome back. 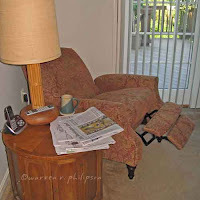 In my recent blog update on exercise, I mentioned the newspaper deliveryman. In a sign of the times, fewer newspapers are being delivered on our street. By fewer, I mean the number of newspapers has fallen to the pavement and been washed down the storm drain. 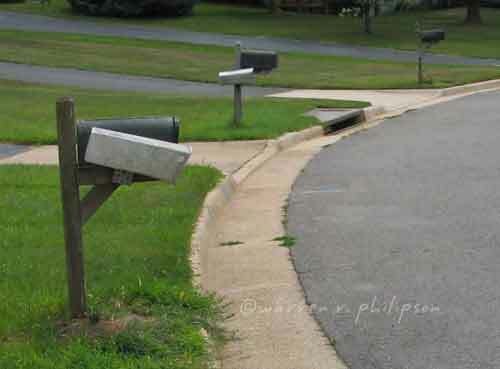 When I began jogging here 15 years ago, if I encountered the delivery person’s vehicle, we traveled at a comparable pace and could monitor each others progress, house by house. Now, several delivery persons later, the delivery car speeds by. Well, sometimes he discovers that he skipped a house and either throws the car into reverse or U-turns around, causing me to execute a nimble evasive maneuver. 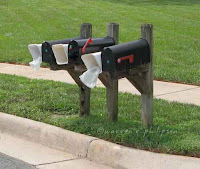 The loss of subscribers and wholesale use of plastic newspaper bags are reflected on the street-side mailbox posts, all of which once held white newspaper delivery tubes. I’ll guess half of the tubes are gone. 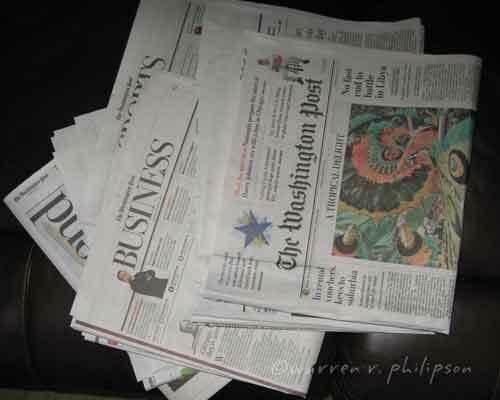 Newspapers are now normally tossed from car window to driveway, tube or no tube. 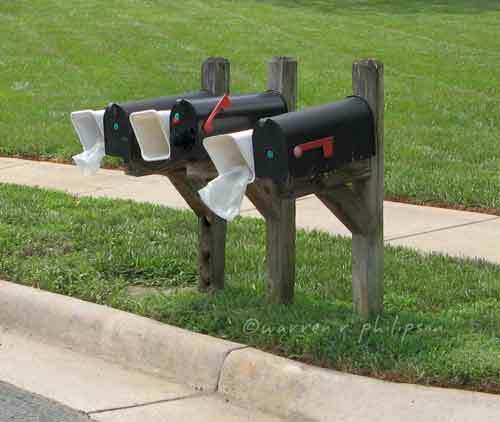 Delivery tubes must still be helpful where there’s a cluster of mailboxes belonging to a group of houses on a private driveway, away from the street. 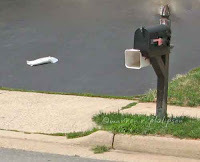 Stuffing the correct tube would avoid any question of ownership that could arise with a newspaper on the ground. We never subscribed. Given my schedule before retiring, it would have been pointless unless we were planning to compete in a newspaper recycling contest. I regularly bought the Friday and Sunday editions, but the paper arrived too late in the morning and my evenings were too short. Also, by the end of the day, I wanted that day’s news. Like many who’ve canceled their subscriptions, I long ago bookmarked a laundry list of Internet news media and related websites to supplement TV and radio news. You probably have your own list or news aggregator. Here’s a sample of about half of my links in case you’d like to share. Some limit the number of views for non-subscribers. I don’t check them all daily. For edification, I do try to review them in at least pairs (except for sports scores). It’s always a kick to see what’s featured and how it’s treated on different websites. 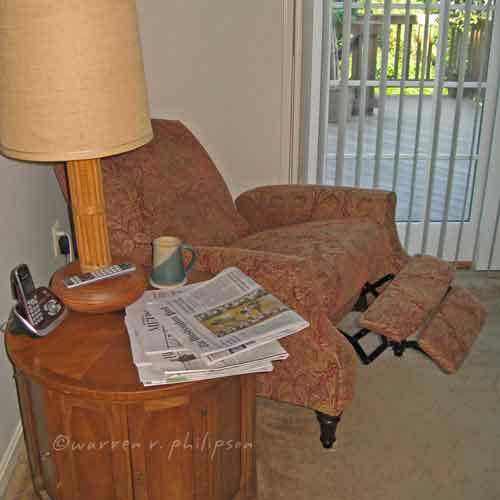 Now that I’m retired, I continue to buy the newspaper twice a week even if there’s less of it. Should I subscribe? Am I ready to admit to myself and to the deliveryman that I have time to sit back, sip my coffee and digest yesterday’s events and analyses? Thanks for stopping by. I’ll write more about my reading habits next week. I should have a photo addendum before that.